in October I said I will publish some of the photos of my trip to Poland. Today I would like to share some of my photos from Wrocław, the capital of Lower Silesia. Unfortunately my photos of the Silesian Piast stone sculpted funerary monuments displayed at the National Museum are disappointing. First, the photo of a stirrup and a spur, they come form the National Museum in Wrocław, and according to the description the stirrup comes from the vicinity of the city, and is dated to late XV century. The spur is also dated to XV century. The figure of an unknown saint as a knight, wooden painted sculpture from XV century, also at the Museum. Piast late X- early XI century spear points found on Ostrów Tumski, also at the Museum. Some views of the medieval Saint John the Baptist Cathedral at Ostrów Tumski, destroyed during World War II and painstakingly rebuilt by Polish people during the post-1945 era. 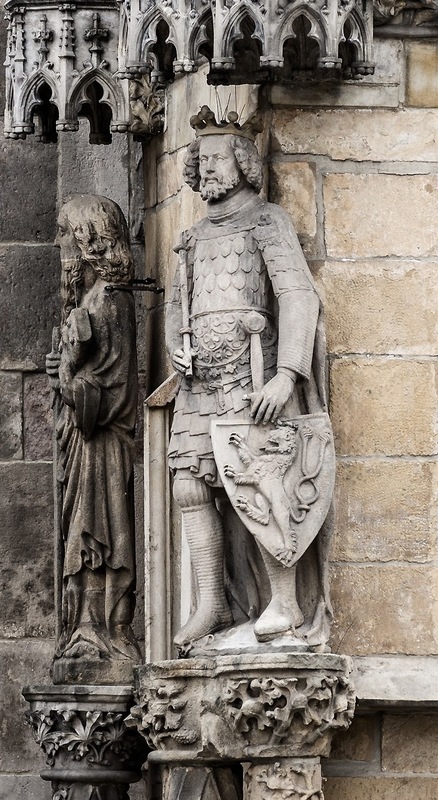 with the detail of the main portal, a stone sculpted full body portrait of Bohemian King and Holy Roman Emperor Charles IV in an interesting armour. This monarch was one of the greatest knights of the Late Middle Ages. In this portrayal his shield is naturally adorned with the Bohemian Lion. Nota bene Charles IV brought Wrocław and most of Lower Silesia under his rule, adding Piast Silesia to the Crown of Bohemia. In the wall of the south tower of the Cathedral there is a stone sculpture - head of a man - integrated into otherwise brick wall structure of the tower. There are various legends about this head, perhaps to be told some other time.